Change Day BC…back by popular demand! BCPSLS is thrilled to participate in BC’s Change Day this Friday, November 17, 2017! Change Day first began in 2013 with the National Health Service (NHS) in England and it has since spread to become a global movement. BC launched its first Change Day in 2015, facilitated by the BC Patient Safety & Quality Council along with a number of partners and ambassadors. The essence of Change Day is a pledge to improve the quality of healthcare. Pledges can be made by individuals or teams and can be big or small. They can cover a variety of themes, such as empathy, self-care, cultural humility, and role modeling. There have been over a million pledges made since Change Day began. The team at BCPSLS Central Office is proud to be a part of this worldwide movement endeavouring to make a positive difference. What will your pledge be? 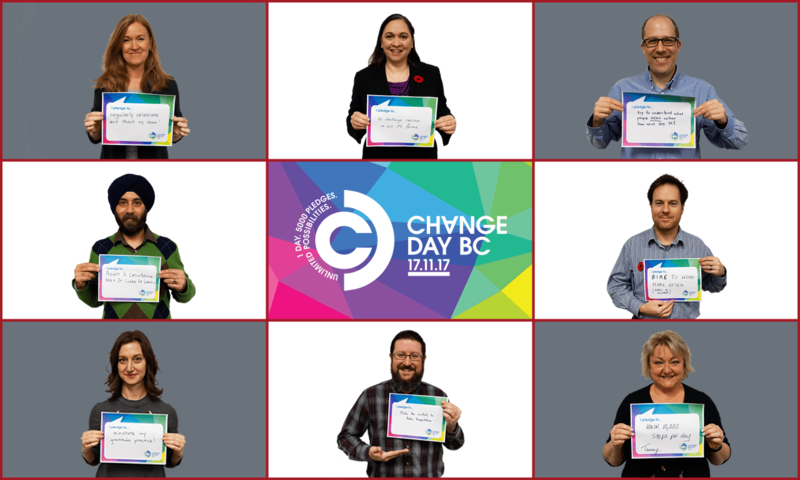 Inspire others by sharing your pledge at changedaybc.ca. Annemarie Taylor: I pledge to…regularly celebrate and thank my team! Catherine Reid: I pledge to…challenge racism in all its forms. David Gasson: I pledge to…try to understand what people MEAN rather than what they SAY. Tammy Simpson: I pledge to…walk 10,000 steps per day. Martin Jurkovic: I pledge to…make the switch to public transportation. Kim Steger: I pledge to…reinstate my gratitude practice! Inderpal Chani: I pledge to adopt a catch basin and keep it clear of leaves. Interested in some virtual celebrating? Consider yourself invited! The BC Patient Safety & Quality Council is hosting an online “drop-in style” event this week on November 17, 2017. For more information or to register for the event, please visit the Virtual Celebration registration site. Enjoy getting connected to Change Day! I would like to get some idea on how these pledges can be reinforced and operationalized. They look like free standing articulations of subjects and objects in sentence structure – but how do they fit into a regime of social solidarity for transformation? Thanks for your reply. I see pledges as important – and I also have made one – but I feel people need a reification and review process so these get beyond being free standing sentiments. Thank you for your thought-provoking question and for participating in Change Day. While many pledges are free standing goals, as you note, the premise of Change Day is that individual acts of change will result in significant improvements in health, social, and community systems. Many pledges are team or program-based, which may promote reinforcement and solidarity. It is also encouraging that Change Day has become a global movement and in some cases, an annual event. It has been exciting to see how this initiative continues to grow and evolve.